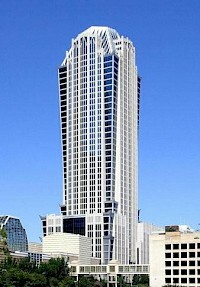 112 Tryon Plaza is a 280 ft (85 m) 22-story skyscraper in Charlotte, North Carolina. It was the second tallest building in North Carolina when completed in 1927, and the tallest building in Charlotte for about 35 more years. It is currently the 21st tallest building in the city. Located on "The Square" at the corner of Trade St. and Tryon St. adjacent to a pocket park, this building has a premiere location in Uptown Charlotte, also known as Charlotte center city. 121 West Trade,also known as the Interstate Tower, is a skyscraper located at the Trade and Tryon, in Charlotte center city, North Carolina. The post modern building was designed by Kohn Pedersen Fox Associates. It also has 330,000 feet (101,000 m) of Class A office space. 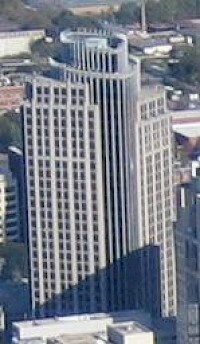 129 West Trade is a 227 feet (69 m) skyscraper in Charlotte, North Carolina. It was built in 1958 and has 15 floors. The building is clad with 3,822 - 2,000 pound (890 kg) precast concrete facade panels which measure 5.5 by 6 feet (1.6 by 1.8 m). This building was home to the Wachovia Charlotte office prior to 1975, when the bank moved to 400 South Tryon. The Charlotte Chamber of Commerce occupied the building from 1975 to 1995. Fifth Third Center, formally known as the IJL Financial Center and 201 North Tryon, is a 447 feet (136 m) skyscraper in Charlotte, North Carolina. It was competed in 1997, and has 30 floors. It is located at the intersection of West Fifth Street and North Tryon Street, and is the 8th-tallest building in Charlotte. It was designed by Smallwood, Reynolds, Stewart, Stewart & Associates. 400 South Tyron, formally called the Wachovia Center, is a skyscraper in Charlotte center city, North Carolina. When it was being built, there were rumors that the developer intended to add ten more floors to pass Bank of America Plaza, and become the tallest building in Charlotte. It is now the 11th tallest building. The Bank of America Corporate Center is an 871 ft (265 m) skyscraper in Uptown Charlotte, North Carolina. When completed in 1992, it became and still is the tallest building in North Carolina as well as the tallest building between Philadelphia and Atlanta, Georgia; it is 60 stories high. It is the 76th tallest building in the world. The Carillon Tower is a 394-foot (120 m) tall skyscraper in Charlotte, North Carolina. The building was completed in 1991 and it has 24 floors. The top of the skyscraper contains a copper-roofed, Gothic central spire shaped like a bell tower, which rises 300 ft (91 m) from the base of the building. This structure is considered to be the most striking feature of the property, and it was designed to resemble the architecture of the historic First Presbyterian Church located across the street. The Duke Energy Center is a 786 feet (240 m) tall, 48-floor (54 floors including mechanical floors) skyscraper in Charlotte, North Carolina. When completed in 2010, it was the second tallest building in Charlotte, and the tallest in the world to use precast double tees built by Prestress of the Carolinas. The building and adjacent cultural arts campus are owned by Wells Fargo. The Hearst Tower in Charlotte, North Carolina is a 47-story skyscraper along North Tryon Street that rises 659 feet (201 m) in height. 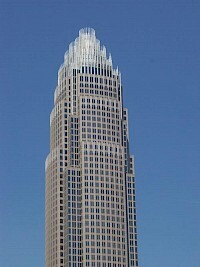 It opened on 14 November 2002 and is the 3rd-tallest building in Charlotte. The 32-story tower rests atop a 15-floor podium. Located within the podium is a three-story, 180,000-square-foot (17,000 m) trading floor designed by Skidmore, Owings & Merrill and operated by Bank of America. 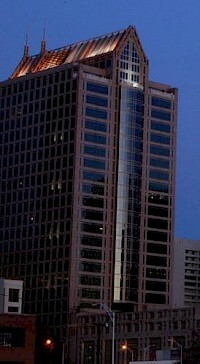 One Wachovia Center is a skyscraper in Charlotte, North Carolina. It is the headquarters for Wells Fargo subsidiary Wachovia. 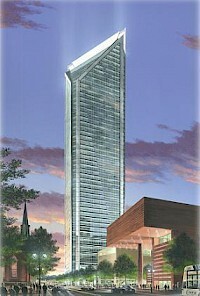 At 588 feet (179 m) tall and 42 stories, it is the fourth tallest building in Charlotte. When it was opened on September 14, 1988 it was the tallest building in North Carolina. 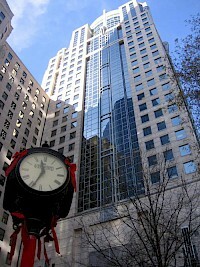 In 1992, One Wachovia Center was surpassed by the Bank of America Corporate Center, and again in 2002 by Hearst Tower, another Bank of America building.